Blessed be the LORD, the God of our ancestors, who put such a thing as this into the heart of the king to glorify the house of the LORD in Jerusalem, and who extended to me steadfast love before the king and his counselors, and before all the king's mighty officers. I took courage, for the hand of the LORD my God was upon me, and I gathered leaders from Israel to go up with me. Then I proclaimed a fast there, at the river Ahava, that we might deny ourselves before our God, to seek from him a safe journey for ourselves, our children, and all our possessions. For I was ashamed to ask the king for a band of soldiers and cavalry to protect us against the enemy on our way, since we had told the king that the hand of our God is gracious to all who seek him, but his power and his wrath are against all who forsake him. So we fasted and petitioned our God for this, and he listened to our entreaty. Then I set apart twelve of the leading priests: Sherebiah, Hashabiah, and ten of their kin with them. And I weighed out to them the silver and the gold and the vessels, the offering for the house of our God that the king, his counselors, his lords, and all Israel there present had offered; I weighed out into their hand six hundred fifty talents of silver, and one hundred silver vessels worth... talents, and one hundred talents of gold, twenty gold bowls worth a thousand darics, and two vessels of fine polished bronze as precious as gold. And I said to them, "You are holy to the LORD, and the vessels are holy; and the silver and the gold are a freewill offering to the LORD, the God of your ancestors. Guard them and keep them until you weigh them before the chief priests and the Levites and the heads of families in Israel at Jerusalem, within the chambers of the house of the LORD." So the priests and the Levites took over the silver, the gold, and the vessels as they were weighed out, to bring them to Jerusalem, to the house of our God. Then we left the river Ahava on the twelfth day of the first month, to go to Jerusalem; the hand of our God was upon us, and he delivered us from the hand of the enemy and from ambushes along the way. We came to Jerusalem and remained there three days. On the fourth day, within the house of our God, the silver, the gold, and the vessels were weighed into the hands of the priest Meremoth son of Uriah, and with him was Eleazar son of Phinehas, and with them were the Levites, Jozabad son of Jeshua and Noadiah son of Binnui. The total was counted and weighed, and the weight of everything was recorded. At that time those who had come from captivity, the returned exiles, offered burnt offerings to the God of Israel, twelve bulls for all Israel, ninety-six rams, seventy-seven lambs, and as a sin offering twelve male goats; all this was a burnt offering to the LORD. They also delivered the king's commissions to the king's satraps and to the governors of the province Beyond the River; and they supported the people and the house of God. Then I saw another portent in heaven, great and amazing: seven angels with seven plagues, which are the last, for with them the wrath of God is ended. And I saw what appeared to be a sea of glass mixed with fire, and those who had conquered the beast and its image and the number of its name, standing beside the sea of glass with harps of God in their hands. And they sing the song of Moses, the servant of God, and the song of the Lamb: "Great and amazing are your deeds, Lord God the Almighty! Just and true are your ways, King of the nations! Lord, who will not fear and glorify your name? For you alone are holy. All nations will come and worship before you, for your judgments have been revealed." After this I looked, and the temple of the tent of witness in heaven was opened, and out of the temple came the seven angels with the seven plagues, robed in pure bright linen, with golden sashes across their chests. Then one of the four living creatures gave the seven angels seven golden bowls full of the wrath of God, who lives forever and ever; and the temple was filled with smoke from the glory of God and from his power, and no one could enter the temple until the seven plagues of the seven angels were ended. Now when Jesus heard this, he withdrew from there in a boat to a deserted place by himself. But when the crowds heard it, they followed him on foot from the towns. When he went ashore, he saw a great crowd; and he had compassion for them and cured their sick. When it was evening, the disciples came to him and said, "This is a deserted place, and the hour is now late; send the crowds away so that they may go into the villages and buy food for themselves." Jesus said to them, "They need not go away; you give them something to eat." They replied, "We have nothing here but five loaves and two fish." And he said, "Bring them here to me." Then he ordered the crowds to sit down on the grass. 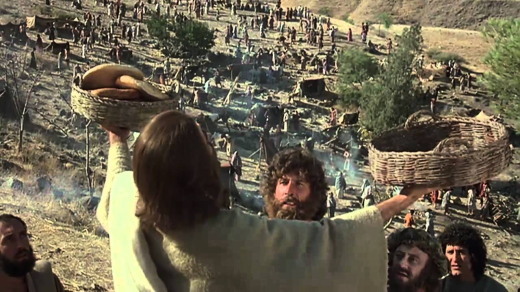 Taking the five loaves and the two fish, he looked up to heaven, and blessed and broke the loaves, and gave them to the disciples, and the disciples gave them to the crowds. And all ate and were filled; and they took up what was left over of the broken pieces, twelve baskets full. And those who ate were about five thousand men, besides women and children. O God, the Father of all, whose Son commanded us to love our enemies: Lead them and us from prejudice to truth: deliver them and us from hatred, cruelty, and revenge; and in your good time enable us all to stand reconciled before you, through Jesus Christ our Lord. I see the paper, the markings; the ink lines connected to make words. I run my finger across the lines but can only feel the impression left by a pen. I can’t see the instrument, nor even the ink in the well, only the ink left on the page. I can’t see the hand, yet I know there was a hand, and a mind that formulated the words which hold meaning. Only words! That’s all that remains. So, I read the words, looking at how the lines were made and know that someone I loved left that ink on that paper. It’s mine. I hold it fast. It’s not much, but it’s all I have. Only words of someone’s mind that knew me. Someone’s hand that held my hand. Someone’s words that said, “I love you.” Furthermore, I believe it. The Word was in the beginning and was God. That is what scripture tells us. The Bible also tells us that creation started with the Word. “Let there be light,” and it was so. We are also told that the Word became flesh, and dwelt among us. Jesus, the son of God who was in the beginning with God, became that flesh. At least, this is what the Word says. The Bible; God’s Word, symbols written down over, and over again, changing languages through the ages. We can’t see John, or Paul sitting in a prison cell giving the words. We can’t see Timothy, or Peter possibly having someone else transcribe their stories. We can’t see Moses parting the sea, or Isaiah predicting the coming of the Messiah. We can't see David writing poetry, or his son Solomon giving words of wisdom. But, we do have the words. We know that the words have been directed by the mind that formulate the story. The story is beautifully instrumented by God, the author and creator from the beginning to the end. The pinnacle is Jesus Christ, God in the flesh, born, preaching, performing miracles, crucified, dead, and buried, the Messiah, risen, victorious over death, bringing us new life. The words are all we have. We can’t see Jesus walking the streets, performing miracles, or bending down to write in the sand, but we do have the story in the Word. It’s ours. We can hold it fast to our hearts or we can turn our back to it. The words are read with our eyes, deciphered with our mind, and if we allow, pierces straight to our heart. It is then we comprehend, and the Word sinks into our very existence. The Word is God: the hope of God, the help of God, the instructions of God, the love of God, and the gift of God. The Word is timeless. The Word is unchanging, yet changes us forever. The message of the Word is, “I love you.” Furthermore, I choose to believe it! Scripture taken from The Holy Bible, English Standard Version. ESV® Text Edition: 2016. Copyright © 2001 by Crossway Bibles, a publishing ministry of Good News Publishers. Devotion shared by Jenny Calvert. The Word is unchanging, yet changes us forever. “He wakens me morning by morning, wakens my ear to listen like one being taught. The Sovereign LORD has opened my ears, and I have not been rebellious; I have not drawn back”. 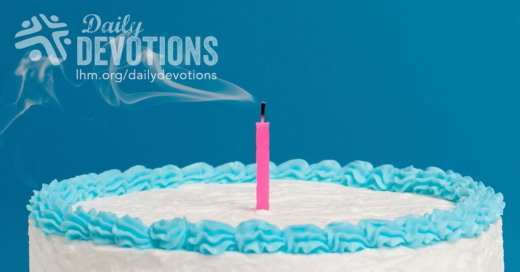 LHM Daily Devotion - November 10, 2017 "Loneliness"
From my experience on The Lutheran Hour, I know that there is no topic..
Loneliness is a nasty beastie. From my experience on The Lutheran Hour, I know that there is no topic which generates more responses than the topic of loneliness. Loneliness grabs hold of the rich and poor, young and old, the popular and the outcast. Here is one loneliness story you might like. In Hurst, Texas, the parents of Graham Day were celebrating his eighth birthday with a party. It wasn't the first time they had thrown Graham a party. They had tried two years ago when he had turned six. For that birthday bash they had sent out 19 invitations, and none of those invited showed up. Graham's mother, Jennifer, had made up one excuse after another to make her son feel better. In actuality, she believes the other children are frightened by Graham's brother who has autism and can, at times, become explosive. Still, that was then and this is now. Everybody is two years older, and the Days thought they would try again. And they ended up with the same results: nobody came. Only this time there was no way Jennifer could come up with explanations which held water. As for Graham, he said, "This always happens." That was when Jennifer said she snapped. She said to herself, "This is not okay. This is not happening. I can fix this, and I've got to try." Jennifer and her husband went to the local police department and asked Lieutenant Mark Schwobel if he could "spare a man to help celebrate the birthday of a lonely boy who hopes to grow up and become an officer." Officer Schwobel said he would come. Then he volunteered his crew ... and a few firemen as well. Schwobel says that when they got to Graham's house, they turned on the squad cars' lights, hit the siren and .... well, wide-eyed Graham came running. He was in shock that all these important people had come for him. As a good host, he served pizza and cake and showed the men his gifts. His mother says he has not yet come down from the high: the high of not being lonely. Pretty touching, don't you think? Now I know the folk of these departments can't go to the birthday party of every lonely child, but I'm glad they went to this one. It was the right thing to do. Long ago, shortly after humankind's fall into sin, the Lord looked at our fate, the pain, the loss, the loneliness, and the fires of damnation, and He said, "I can fix this. I've got to try." To that end, He sent His Son into this world to be with us, to reach, to rescue us, to forgive, and save us. All of these gifts were wonderful, but there is one more which ought not be ignored. That gift is the Lord's presence. In the New Testament, Jesus says He is with us always; in the Old Testament, we have the Father's promise: "Do not fear or be in dread of them, for it is the LORD your God who goes with you. He will not leave you or forsake you." The world may desert us; best friends may betray us, but the Lord is here. He is waiting to hear our prayers, our fears, our terrors and then, having heard, give us the means to deal with them. THE PRAYER: Dear Lord, the world is filled with those who are alone or feel alone. May they be turned to see Your love and ongoing care for them. This I ask in the Savior's Name. Amen. Antes de la llegada de Cristo, las personas buscaban algo en qué creer. Tenían la Ley de Dios, pero ella sólo los acusaba de todo lo que no eran capaces de cumplir, y les advertía que el castigo era la muerte. El pueblo estaba en crisis. Esa crisis afectaba todos los aspectos de la vida: la política, la economía, la salud y hasta la vida espiritual. Algo similar sucede hoy en día, con la diferencia que Jesús nos ha traído perdón y la esperanza de la vida eterna. Con su muerte en la cruz, Jesús asumió la condenación de nuestros pecados en sí mismo, y a través de su resurrección venció la muerte y el castigo eterno. El mundo está gobernado por las leyes físicas; la descomposición es el fin natural de cualquier ser viviente. Pero los científicos están tratando de prolongar la vida humana desarrollando sistemas y tecnología con la esperanza de evitarla. Sin embargo, existe algo simple -y remarcable- que nos da la fe. 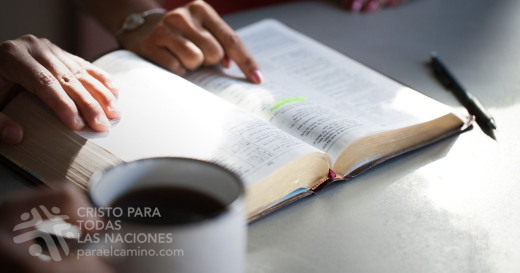 Sea que usted tenga dinero o no, únicamente la fe en Jesucristo nos provee esperanza. El apóstol Juan escribió: "Les escribo estas cosas a ustedes que creen en el nombre del Hijo de Dios, para que sepan que tienen vida eterna" (1 Juan 5:13). Pero: ¿cómo podrá alguien creer, si no ha escuchado? Es ahí donde Dios lo usa a usted, ¡para que comparte con quienes le rodean, lo que Él ha hecho en su vida a través de Jesucristo! ORACIÓN: Dios todopoderoso, te doy gracias por el amor y la vida que me has dado a través de la muerte y resurrección de tu hijo Jesús. Ayúdame a reconocer las oportunidades y dame las palabras para compartir tus buenas noticias con otros. En el nombre de Jesús, mi Salvador, te pido esto. Amén. Biografía del autor:El Pastor Igor Savich es el Director de la oficina de Cristo Para Todas Las Naciones en Rusia.